Evan Armstrong | President of Armstrong & Associates Inc. The year 2018 will go down as an outstanding year for third-party logistics in the United States. The two main drivers of growth were an extraordinary inventory buildup as shippers imported products to beat the implementation of President Donald Trump’s import tariffs and solid domestic economic expansion. Coupled with tight domestic carrier capacity driving up rates, increasing fuel surcharge revenue and expanding e-­commerce business, the 2018 3PL market realized extraordinary growth over 2017. While many 3PLs are still providing us with 2018 financials, Armstrong & Associates’ current estimates show U.S. 3PL market net revenue (gross revenue less purchased transportation) grew 11.8% to $86.2 billion and overall gross revenue increased 15.8%, bringing the total U.S. 3PL market to $213.5 billion in 2018. The last time the U.S. saw this level of 3PL gross revenue growth was in 2010, when the 3PL market grew 19% as it bounced back from its 16% decline in 2009 during the Great Recession. The nonasset-based domestic transportation management segment (DTM), which primarily consists of freight brokerage services, led all segments with overall gross revenue increasing a whopping 20.6% to $86.5 billion. DTM providers’ top-line revenues benefited from heavy port-to-warehouse and warehouse-to-warehouse moves, the strong domestic economy, rising carrier rates, increased fuel surcharge revenue and continued outsourcing among shippers. To find a better year, we have to go back to 2005 when the DTM segment had year-over-year growth of 21.2%. When trucking capacity gets tight, shippers often turn to DTM providers for help. A surge in demand for carrier capacity arose in the latter part of 2017 and continued into 2018. Conditions were exacerbated by the regulatory electronic logging device mandate for carriers, which reduced total truckload capacity by more than 3%. Although 2019 has ­started off softer, it seems that pricing levels are holding. Strong demand combined with sequential carrier rate increases allowed DTM providers to plan capacity better than in 2017, positively impacting net revenue growth. The average gross margin increased to 15.5% from 15.2% and net revenue increased a stellar 23.2% to $13.4 billion. The DTM segment is led by C.H. Robinson Worldwide. Net revenue at its North American surface transportation and managed services division increased 16.9% to $1.9 billion in 2018 and accounted for 13.9% of the entire DTM segment’s net revenue. While it is still the segment leader, its market share as measured by net revenue dropped year-over-year and is significantly lower than 10 years ago, when its market share was over 20%. On the DTM “watch list” is Austin, Texas-based Arrive Logistics and Nolan Transportation Group. Arrive had year-over-year net revenue growth of 140% to $48 million and gross revenue of $368 million, pushing it over the $300 million purchased transportation hurdle; it now has the purchasing power of the largest shippers in the U.S. NTG had year-over-year net revenue growth of 76.9% to $107 million and gross revenue of $811 million. Gryphon Investors bought a majority stake in NTG through its portfolio company Transportation Insight earlier this year. One thing digital freight brokers such as Uber Freight, Convoy and Transfix have done is to place an emphasis on “digitalizing” DTM operations. While managed transportation has been fairly automated for years via transportation management systems, electronic data interchange and other systems interfaces, most freight brokerage operations still have many manual carrier sales and procurement and back-office processes. A plethora of technology solutions has come to market over the past three years to augment traditional TMS systems and automate freight brokerage operations. These tend to fall into four groups: account management automation, capacity intelligence and load execution, visibility and exception management, and back-­office automation. Large 3PL mergers and acquisitions made a comeback in 2018 with 12 deals having purchase prices over $100 million. Financial buyers continue to be motivated investors in the 3PL nonasset/light-asset space as they find attractive internal rates of return and cash-to-cash payoffs. The Jordan Co. has been quite prolific with its 2017 acquisitions of Odyssey Logistics & Technology and Unitrans Inc., and its 2018 acquisition of GlobalTranz. Strategic buyers CJ Logistics and Hub Group made significant acquisitions in 2018. 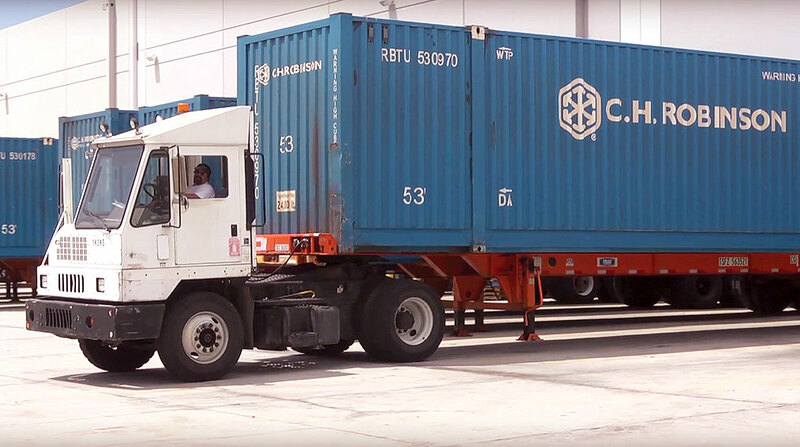 Korea’s CJ Logistics acquired DSC Logistics for $216 million to expand its value-­added warehousing and distribution footprint in the U.S. and Hub Group acquired CaseStack for $255 million, providing it with an integrated warehousing and domestic transportation management service offering. XPO Logistics, which was on a buying binge through 2015, was quiet again. We expect continued velocity in 2019 as the market is abuzz with some potential mega deals. However, deal flow continues to be challenging as too many buyers and too much money are following a limited number of deals. Tightness in domestic motor carrier capacity drove ­solid growth within the more mature, asset-heavy dedicated contract carriage (DCC) segment. As shippers struggled to find capacity in for-hire carrier and spot markets, some turned to DCC to lock in capacity. We estimate that dry van trailers are used for 70% of DCC truckloads, reefers 16%, flatbeds 6%, and tankers and others 8%. DCC segment net revenues in 2018 grew an esti­mated 15.8% to $17.8 billion. The domestic segment leader, J.B. Hunt Dedicated Contract Services, which has 10,115 power units in dedicated, posted outstanding net revenue growth of 25.9% to $2.2 billion, pushing its DCC market share over 12% on a net revenue basis. We expect more moderate DCC demand going into 2019 with growth closer to 2017’s 10.2%. A lot will depend on underlying contract truckload rates. Meanwhile, the international transportation management (ITM) segment, consisting of air and ocean freight forwarding and complementary value-added services, posted 15.5% gross revenue growth to $61.9 billion in 2018. This was ITM’s best showing since 2010, when the segment bounced back over 30% from the Great Recession. In 2018, ITM participated in the import tariff inventory builds and increased airfreight primarily due to growth in e-commerce. Customs compliance departments within freight forwarders also saw increased business as shippers worked to minimize the impact of new import tariffs. ITM net revenues grew 11% to $21.9 billion in 2018. Ocean freight remains in an overcapacity situation and we anticipate low single-digit TEU (20-foot-equivalent unit) growth in most trade lanes in 2019. Airfreight volumes declined at the end of 2018 and have been soft at the beginning of 2019, but the hope is that a new U.S.-China trade deal and e-commerce volumes should put a floor on potential declines. Expeditors International of Washington, the largest of the U.S.-based freight forwarders, had a very good year with gross revenue increasing 17.6% to $8.1 billion and net revenue increasing 13% to $2.6 billion. Customs brokerage and other services, which includes DTM and VAWD, is now Expeditors’ fastest growing business segment. It has grown to 45% of Expeditors’ total net revenue; airfreight is 33% and ocean freight has declined to 22%. Even with the import tariff inventory builds, value-­added warehousing and distribution (VAWD) had the lowest rate of growth in 2018 compared with its transportation management brethren. However, VAWD’s gross revenue growth of 8% to $43.3 billion was the best the segment has realized since 2011, when it posted an 8.3% increase. Net revenue grew 6.3% to $33.1 billion. While many warehouses were full in 2018, pricing pressure continues to dominate the business landscape. Additionally, the “Amazon effect” is impacting VAWD providers, which are seeing increased competition from Amazon for labor and warehouse space. This has dramatically impacted warehouse employee wages and lease rates in key distribution areas such as Plainfield, Ind. In turn, it is driving significant interest from VAWD providers to automate warehouses with robotic solutions to support activities such as picking, put-away and cycle counting. Looking ahead, 2019 could be an interesting year for VAWD without the extraordinary import tariff inven­tory build the segment experienced last year. If customers decide to draw down inventories to reduce carrying costs, some VAWD providers could see a significant decrease in utilization. Armstrong & Associates Inc. is a market research and consulting firm based in West Allis, Wis. The company publishes a Who’s Who in Logistics and Supply Chain Management, provides legal and expert witness services and advice on mergers and acquisitions to investors, industry analysts and supply chain participants. Does Your Business Belong on Our List of Top 50 Logistics Companies?